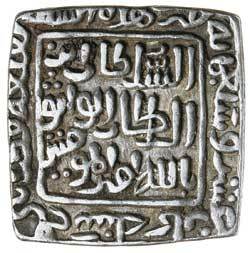 SULTANS OF DELHI, Qutb al-din Mubarak, (A.H. 716-720, A.D. 1316-1320), square silver tanka, Qila' Qutbabad Mint, (10.93 g), A.H.718 (1318-1319), (cf.G&G D261, ONS Newsletter 174, p.26 [this coin - designated as D268]). Good very fine, and extremely rare. Ex Dr V.J.A. 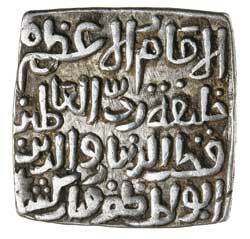 Flynn Collection and Baldwin's Auction Sale 53, 25 September 2007, (lot 1579, the coin realised �1300 in this sale).